The ProfiMessage D has a modular master/slave design. Both the master and slave devices can each accommodate two I/O modules. A single master can control up to 20 slaves allowing up to 660 I/O channels in a single system. There is a range of analog and digital I/O modules which allow the system to meet the requirements of all types of industrial DAQ applications . A network interface enables ProfiMessage devices to be integrated into a TCP network or to be directly connected to a PC workstation or laptop computer. Online measurement data can be transmitted, saved and processed. The data can be stored simultaneously within the ProfiMessage D device itself. 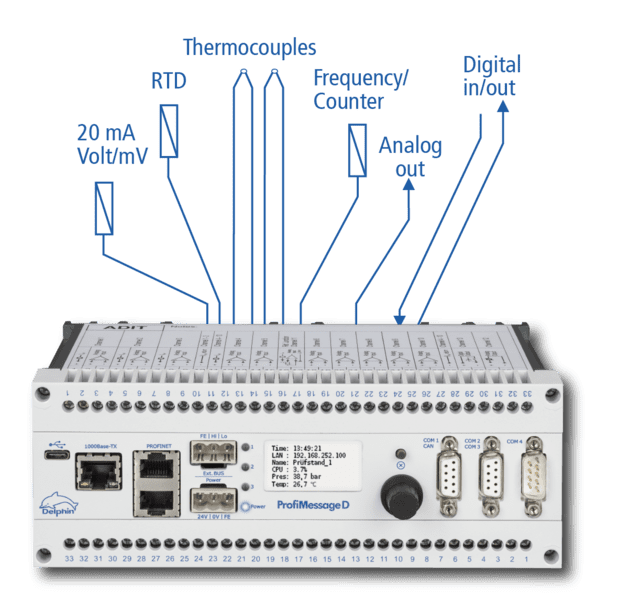 ProfiMessage D’s universal inputs enable the connection of signals of any type including non-isolated signals. This means costly measurement transducers are usually not necessary. Potential isolation between channels as well as differential inputs saves both time and money. Universal inputs enable any unit of measurement to be acquired (e.g. temperature, pressure flow, vibration etc.). Data then undergoes direct scaling and linearization. Conversions from mA to bar or ml/min take place directly within the ProfiMessage D data acquisition system. High measurement precision is achieved through the use of 24-bit resolution Sigma-Delta converters and enables the connection of the smallest of signals (e.g. thermocouples). The configuration of the ProfiMessage D is done using a PC with the user-friendly DataService Configurator software. Configuration data is processed online and permanently within the devices. Optional integrated data memory up to 32 GB can locally store billions measurement values. The ProfiMessage D has an intelligent local controller which allows it to operate as a stand-alone device. This controller also provides many functions such as limits/alarms, calculations, logic and other functions through software channels. This allows the system to be configured to meet the needs of many different types of applications without having to learn a complicated programming language. The optional ProfiSignal software package is a Windows based application available in three versions which provides a full range of capabilities from visualization and data archiving to fully automated test systems with report generation. Optional modules provide additional capabilities such as connecting to SQL databases, vibration analysis or FDA CFR21 Part 11 compliance. The new ProfiSignal Web is a client/server application that allows platform-independent access to (remote) measurement projects from any standard web browser. The ProfiMessage D series has 2 types of devices: masters and slaves. The master device contains the CPU unit and data storage capability. Salve devices serve as extensions to the master device. Each device can be equipped with 1 or 2 I/O modules. The ProfiMessage master is connected via standard cabling with a TCP/IP network. Slave devices are connected to the master via a CAN bus. Any number of master devices can be connected into a network. A maximum of 1000 I/O channels can be processed within a master-slave system. Each device (master or slave) can accommodate 2 different input/output modules. There are no restrictions in to which slots the modules are inserted. Sensors are connected via detachable clamps. For servicing, the rows of clamps can easily be removed by undoing 2 screws without having to disconnect any cabling. Even with large numbers of channels the measuring rate is not affected by the number of input/output modules, with a maximum rate of 600Hz for standard modules. Each module is equipped with an A/D converter. A multiplexer consecutively connects each separate measurement channel. Very precise measurement accuracy; resolution 24 bit; Autocalibration. ProfiMessage D devices can be easily connected up to existing data networks. Large quantities of data can be transferred and accessed via PCs. The ProfiMessage D master device (see illustration) is connected to the Ethernet using standard cabling. Practically any number of master devices can exist within a data network. The optional OPC UA Client/Server interface allows the ProfiMessage D series devices to send and receive measurement-data exchange at field level. Measurement data and threshold violations can be immediately transmitted to subsystems via OPC UA. The OPC UA interface also provides data exchange to PLC systems and connections to process management systems. The ProfiMessage D master can be extended using slave devices. Slaves are connected to the master via a CAN bus. The CAN (Controller Area Network) is a serial bus system with good transfer properties over short distances. Its main benefits are its high levels of reliability and a set maximum waiting time for high priority messages. The CAN bus is therefore capable of real time processing. It has a transfer rate of 1Mbit/s (adjustable for long cable lines). The ProfiMessage D device is equipped with four independent serial ports which can be used for both the connecting up to PC software (bus manager) or external devices. They can be used for importing data (from weighing machines) or exporting data (display systems). Data exchange is configured via COMPORT (channels). The required interface parameters for the corresponding mode can be configured here. Industry standard protocols are also available such as Modbus RTU, Profibus DP Slave (optional) and Modbus LAN. A serial port can also be utilized as a Profibus DP slave port. The ProfiMessage D device can then read and write signals from a PLC device. At the same time values can be transmitted to the PLC – a 2-way link exists between the PLC and ProfiMessage D device. The optional PROFINET interface supports different topologies, e.g. ring and line while adhering to the CC-B conformance class. ProfiMessage D does not differentiate between data networks and external data transmission. This means all functions available for network processing are also available for external data transmission. Because data can be stored locally within a Message device, uninterrupted data transmission to a central server, at low telephone costs, can be performed without the need for any PC support. Using the internet can further reduce costs. In the event of a malfunction an immediate warning is issued with the automatic sending by email of fault messages and fault occurrences. Events and scenarios can be configured into the system. Malfunction messages can be allocated to these events with data and pre and post history being saved. Switch outputs can also be set enabling the production of warnings and alarms. In network environments emails can also be issued. The AMDT/V module in the ProfiMessage D system provides vibration analysis and monitoring in one system. ProfiMessage’s D modular system enables the simultaneous monitoring of both machine vibration and process values such as temperature and pressure. Choice of standard window functions ‘Hanning’, ‘Flat Top’, etc. The configuration of ProfiMessage done with the included software “Data Service Configurator/Device Configurator”. The representation of the channels is clear and intuitive operation , similar to Windows Explorer. Double-click on a channel will open a configuration dialog in which all channel properties can be adjusted. The individual configuration files are stored in XML format in the ProfiMessage equipment and can be alternatively edited with an XML editor offline. Go with the three different versions, Basic and clicks ProfiSignal is suitable scaleable.